Jeanne de Navarre – History… the interesting bits! In the early years of the 14th Century, scandal rocked the French monarchy to its core and inadvertently contributed to the end of the Capetian dynasty. 1314 was a tumultuous year for France; the final act in the destruction of the Knights Templars was played out when Grand Master, Jacques de Molay and the Preceptor of Normandy, Geoffrey de Charney, were burned to death on the Ile de la Cite. De Molay cursed Philip IV, King of France, and his descendants from the flames. Philip IV would be dead within a year and his dynasty’s rule over France would end with the death of his youngest son, Charles IV, in 1328. Philip’s eldest son and heir, Louis, was married to Marguerite de Burgundy. Louis seems to have been a hard person to live with – his nickname was Louis the Quarreler – and the marriage was said to be unhappy. A daughter, Jeanne, would survive childhood to eventually become Queen of Navarre. The second son, Philip, was married to Marguerite’s cousin, Jeanne d’Artois and Charles, the youngest, was married to Jeanne’s sister, Blanche d’Artois. The royal scandal of 1314 was uncovered due to 2 rather innocuous items; silk purses. On an earlier visit to France Isabella of France, wife of Edward II of England, had given silk purses to her sisters-in-law, as souvenirs of the knighting of her 3 brothers, Louis, Philip and Charles, the sons of Philip IV. When she visited again in 1314, Isabella saw these same silk purses on the belts of 2 knights of the French court; Gautier and Philippe d’Aunay. When Isabella brought this to her father’s attention, the matter was investigated and the brothers were put under surveillance. The 2 knights, it seems, were meeting with the princesses in secret. The whole scandal became known as the Tour de Nesle Affair, as the clandestine meetings were supposed to have taken place in this small palace on the outskirts of Paris (although some sources suggest that events happened at Philip IV’s country retreat of Maubuisson Abbey). Whatever the location, the affair was discovered; all 3 princesses were arrested and questioned. When confronted in a secret court, Marguerite and Blanche confessed to adultery with the d’Aunay brothers. Their heads were shaved and they were sent to life imprisonment in Chateau Gaillard. Blanche’s sister, Jeanne, fared better; she was also arrested, and placed under guard at the Chateau Dourdan. Her marriage with Philip was a very happy one, and it seems she was only guilty of knowing of the affairs. 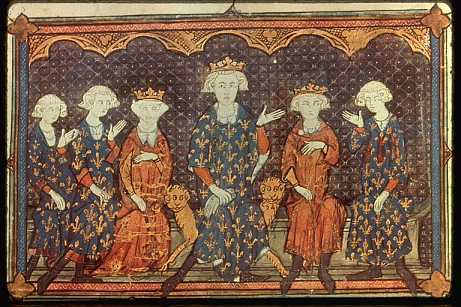 Philip defended his wife before the Paris Parlement and, with Philip’s support, Jeanne pleaded her innocence to the king, and was allowed to return to her husband and the court. The 2 knights were arrested and, after being questioned and tortured, they confessed to the adultery and were condemned to death for the crime of ‘lese majeste’. The unfortunate brothers were castrated and ‘broken on the wheel’ – they were strapped to large wheels, which were spun while their limbs were shattered with iron bars. And finally, they were decapitated. Marguerite’s imprisonment was the most severe. She was badly treated and some sources suggest she was held in a cell at the top of the donjon, open to the elements. On his accession to the throne in November 1314, Louis X applied to the Pope for an annulment of the marriage. However, Pope Clement V died before he could grant the divorce and no new Pope would be elected until 1316. Shortly after Clement’s death, however, Marguerite died – probably strangled on the orders of Louis. 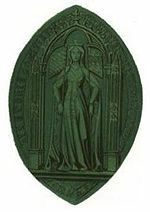 Louis married Clemence of Hungary, but died in June 1316, whilst Clemence was pregnant with their son. Jean I the Posthumous, was born and died in November of the same year and the crown passed to Louis’ brother, Philip V – with Jeanne d’Artois (by then Countess of Burgundy) at his side. Philip died in 1322, leaving only daughters and the crown passed to his brother. On his accession, Charles divorced Blanche – still in an underground cell in Chateau Gaillard – and transferred her to a monastery at Gavray, in Normandy, where she became a nun, dying there the following year. Charles IV died in February 1328, leaving his 3rd wife, Jeanne d’Evreux, pregnant. In April 1328, she gave birth to a daughter, Blanche, and, following Salic Law, the crown passed to Charles’ cousin, Philip of Valois, grandson of Philip III. Salic Law, however, was not in force in Navarre, a kingdom which had come to the French crown when Jeanne I of Navarre had married Philip IV. 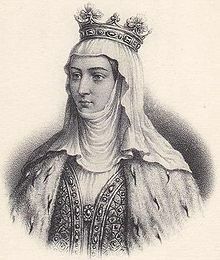 Louis’ daughter, Jeanne, therefore inherited Navarre as Jeanne II, despite the questions that the scandal raised over her parentage. It has been suggested that the Tour de Nesle Affair was all an elaborate plot to destabilise the French monarchy, but most historians believe the adultery took place. The harsh punishments reflected the need for queens and princesses to be above reproach, and the parentage of their children to be beyond question. The scandal cast a long shadow on the last years of the Capetian dynasty, with neither of the 3 brothers producing a son to carry on their line. Sources: Pierre Goubert The Course of French History; Paul Doherty Isabella and the Strange Death of Edward II; J Huizinga The Waning of the Middle Ages; H.G. Koenigsberger Medieval Europe 400-1500; maison-hantee.com; herodote.net; histoirefrance.net. The fourth child and second son of Henry III and his Queen, Eleanor of Provence, and named to honour the Old English royal saint, Edmund was born in London on 16th January 1245. From an early age, Edmund was involved in his father’s schemes to extend Angevin influence across Europe; in 1254 Henry accepted the crown of Sicily from the Pope for the 9-year-old Edmund, but this came to nought and he was to be officially deprived of the kingdom in 1266, when the Pope handed Sicily to Henry’s brother-in-law, Charles of Anjou. Henry and Eleanor are known to have been devoted parents and had a very close relationship with all their children. However, Edmund grew up in a time of great upheaval in the kingdom. 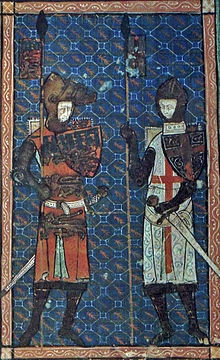 Henry was locked in a power struggle with his barons, led by his brother-in-law, Simon de Montfort, Earl of Leicester. The barons were against expensive entanglements in Europe – such as Edmund’s claim to the Sicilian crown – and what they saw as Henry’s inept and ineffective rule in general. The conflict known as the Barons’ War would lead to what is now seen as the first recognisable English parliament, and to the eventual defeat and destruction of Simon de Montfort at the Battle of Evesham in 1265. Although Edmund’s youth during the war years meant he took no major part in the conflict, following de Montfort’s death, Edmund was given his lands and titles, including the castle at Kenilworth, which was still holding out against the king. Edmund commanded the Siege of Kenilworth, which held out for 6 months, until starvation forced the garrison’s capitulation. A less-than-chivalric move in 1269 saw Edmund and his older brother, Edward, conspiring against Robert de Ferrers, Earl of Derby, a former Montfort supporter, depriving him of his titles and lands – all of which were passed to Edmund. In April of the same year, Edmund married Avelina de Forz, daughter of the Earl of Devon and Aumale. The marriage produced no children and Avelina died in 1274. In 1268 Edward and Edmund had both taken the cross, promising to take part in Crusade to the Holy Land. Although logistics meant they didn’t leave immediately, the brothers travelled separately and Edmund arrived in the Holy Land in September 1271. It is likely that his soubriquet of ‘Crouchback’ comes from him wearing a cross on his back during the Crusades, as there is no evidence of any physical deformity. After some minor victories, but realising their force wasn’t big enough to retake the Holy Land, and reinforcements from Europe were not forthcoming, Edward signed a 10 year truce with the Muslim leader, Baibars. The following month, May 1272, Edmund sailed for home. Henry III died in November 1272 and Edmund’s older brother ascended the throne as Edward I. Edmund was loyal to his brother, throughout his reign, playing a supporting role, both militarily and diplomatically. In 1276, Edmund married again; to Blanche of Artois, the widowed Countess of Champagne, whose daughter, Jeanne of Navarre, would marry Philip IV of France in 1284, making Edmund step-father to the French Queen. 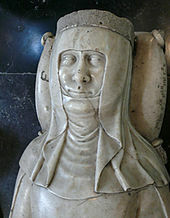 Blanche would outlive Edmund, dying in Paris in 1302. They had 4 children together. Thomas was born before 1280 and was executed on the orders of Edward II, following a failed rebellion and his defeat at the Battle of Boroughbridge. Their second son, Henry would eventually succeed to his brothers titles of Earl of Lancaster and Leicester. Born around 1281, he married Matilda, daughter of Sir Patrick de Chaworth, and they had 7 children together; their eldest son being Henry of Grosmont, 1st Duke of Lancaster. 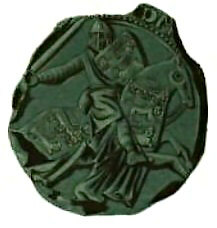 A third son, John, Lord of Beaufort and Nogent, was born before May 1286 and died around 1317, leaving no children. Their only daughter, Mary, died young in France. In Edward’s 1277 Welsh campaign Edmund, the biggest landowner in south Wales, was given the command of the southern army. This second, smaller contingent of the invasion of Wales provided support to Edward’s main army. Having set out shortly after 10th July, Edmund’s force drove deep into Wales, facing little opposition compared to Edward’s army. The main landholders of the south had already capitulated, or had fled to join the Welsh prince, Llewellyn, in the north. Edmund’s army had reached their objective of Aberystwyth by 25th July and, at the start of August, began the construction of the castle there. By September the war was over, Edmund disbanded his army on the 20th – leaving a small contingent to garrison the castle – and returned to England. In 1294 Edmund used his familial connections with the French crown to broker a peace deal with France; an agreement intended to foster a long-lasting peace and to see his widowed brother Edward married to Margaret, Philip IV’s sister. Edmund agreed to hand over several cities, including Bordeaux, in Gascony, on the understanding they would be returned to Edward on his marriage. The French had no intention of returning the Gascon lands, and in April 1294, Edmund realised he had been duped; the French ejected the English Seneschal of Gascony and Edward prepared an invasion force, ordered to muster on 1st September. However, rebellion in Wales meant the postponement of the Gascon expedition and Edmund and his forces were ordered to Worcester. The Welsh having been subdued and Edmund having recovered from unspeicifed illness that struck him at the end of 1295, Edmund and his army finally set sail for Gascony in January 1296. It was to be Edmund’s last campaign. The French were well entrenched and the English failed to retake Bordeaux, or any of the towns along the Garonne. His money running out, Edmund was forced to retire to Bayonne, where he fell sick, dying there on 5th June 1296. A devastated Edward I called on his churchmen to pray for ‘our dearest and only brother, who was always devoted and faithful to us…and in whom valour and many gifts of grace shone forth’. He was buried in Westminster Abbey, recently completed by his father, Henry III. Pictures of Edmund’s coat of arms, seal and Edmund with St George, and of Blanche of Artois, courtesy of Wikipedia. Further reading: Marc Morris A Great and terrible King; Sara Cockerill Eleanor of Castile: Shadow Queen; Roy Strong The Story of Britain; Mike Ashley The Mammoth Book of British Kings & Queens; Derek Wilson The Plantagenets; Alison Weir Britain’s Royal Families.